If you ever travel to Bhutan, a word of advice: don’t ask Bhutanese what they think about Gross National Happiness (GNH). Don’t ask them about the four pillars, the nine dimensions or how many tools and indicators exist. For most Bhutanese, GNH isn’t a structured concept they refer to. Instead, they simply “live it”, since this development philosophy is deeply rooted in Buddhist beliefs, traditions and rituals that shape and guide the rhythm of Bhutan’s daily life. You may, however, ask them about the four auspicious animals that adorn the walls of numerous houses in Bhutan. Three of these animals are mystical creatures and only one is real. These animals represent the qualities and attitudes one has to develop on the path to enlightenment: confidence & mindfulness (Tiger); curiosity & attentiveness (Snow Lion); understanding & fearlessness (Garuda); and gentle power (Dragon). These qualities and attitudes suggest ways of being and acting in the world. They also represent the four stages of personal development, encouraging us to progressively reconnect to self, to others, and to the environment (soil, soul, and society) in a time when everything tries to distract us from those very things. 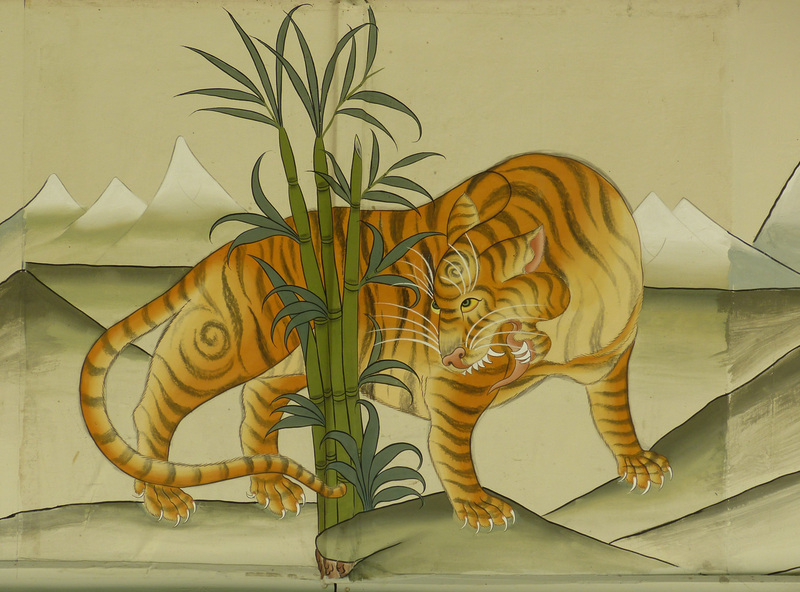 Being mindful, like the tiger, who walks confidently through the jungle, observing carefully whatever happens around him. Practicing openness – and simply paying attention to whatever is happening – without anticipation and judgment. Getting out of our “automatic mode” and acting consciously. 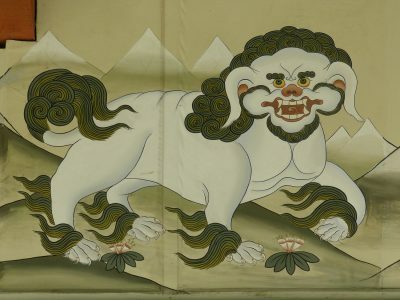 Being genuinely curious about others and the environment, like the snow lion (emblem of Tibet), jumping from one mountain peak to another in the Himalayas, exploring the world, nature, elements, and others. Being open and eager to learn about other ways of doing things. Ascending to new heights, like the Garuda, or Tibetan Eagle, high in thesky. Being willing to expand one’s horizon in order to gain new perspectives and profound understanding, which enables us to come up with innovative solutions. Built on the first three stages, assuming responsibility and setting an example. Creating an environment based on sincerity and authenticity. Communicating in an inspiring and engaging way. These four stages of personal development cover the four GNH Pillars, as the four auspicious animals actually inspired the four pillars approach. Tiger (Tak) – Environmental Conservation; Snow Lion (Seng) – Preservation and Promotion of Culture; Garuda (Chung) – Sustainable and Equitable Socio-Economic Development; Dragon (Druk) – Good Governance. 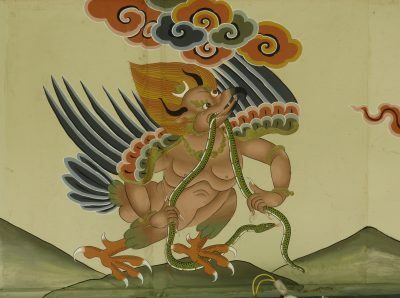 Speaking of the Dragon (Druk in the local Dzongkha language), the King of Bhutan is called Druk Gyalpo, the “Dragon King”. 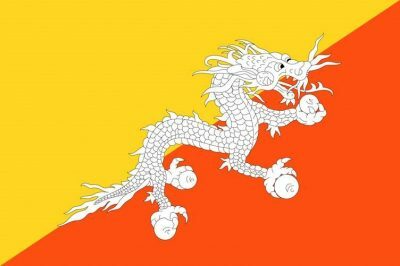 The Bhutanese people call themselves the Drukpa, the “Dragon people,” and Bhutan is also known as Drukyul, which translates as “The Land of the Thunder Dragon.” The flag of Bhutan features the Thunder Dragon.